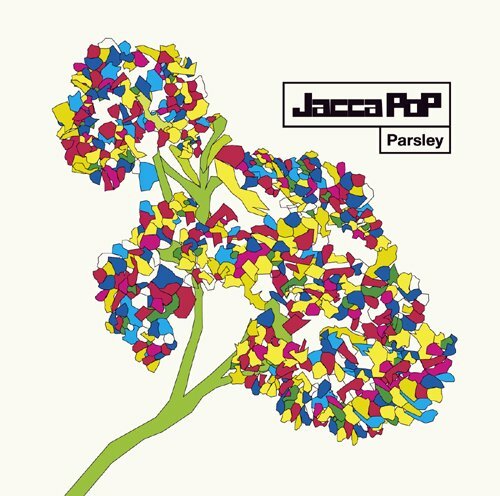 JaccaPop is yet another indie techno-pop group from Japan. What amazes me so much about the Japanese music scene is that unlike American music (at least to my knowledge), you have groups making pop music equivalent to that of the mainstream who are still very much set in the indie scene and playing small clubs. I think one of the biggest misconceptions about Japanese pop is that people lump all forms of pop music together and one assumes that just because one is making pop, you're some mainstream star, but that's far from the case (especially when you have great artists like Mizca who supposedly only sold around 100 copies of her 1st CD during her first week, not to mention the hundreds of Doujin musicians out there who have strong underground followings). But I digress. JaccaPop's sound is very naive, bedroom techno-pop, if you will. Their sound is a bit under-produced in comparison to other groups, but that's where the charm and distinction in their sound lies. Even upon looking at the tracklisting you'll come across grammatically incorrect and misspelled song titles like "Majic Night" and "21th century girl." Singer Sun's voice isn't the strongest, but it fits the music perfectly and it feels endearing to listen to. Miru is the composer for the group, and while his production has little tricks and may not be flashy by any means, the songwriting shows lots of personality. Both members appear to be very young and I believe it shows, but as I mentioned, their lack of experience is what sets them apart, creating a sound that is innocent, playful and endearing. Parsley is only their 1st album and only the start of more amazing things to come. I never heard them before, they seem interesting. Thanks! No prob! They actually just came out with a new album a few months ago, but I don't see it for sale anywhere. It's a shame how hard it is to find info about bands like this.